There are many ways that people can injure their hand or wrist. There are also many types of hand and wrist injuries. There are bones, tendons, ligaments, cartilage, and muscles in the hand and wrist. These can all be injured. Abrasion: this is the medical term for scraped skin. This happens when an injury scrapes off the top layer of the skin. An example is when people "scrape" their knuckles. Pain is usually mild. This can usually be treated at home. Contusion: this is the medical term for bruise. 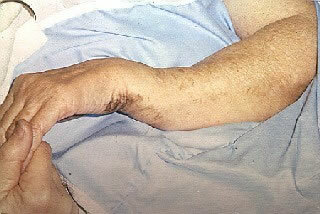 It is caused by a direct blow to the skin and muscles. The skin is not broken and there is no cut. The bruised skin may first look red, then purple, and finally orange-yellow. These skin color changes are from blood that leaked from tiny torn blood vessels in the bruised area. The skin may also be swollen. Pain is usually mild to moderate. Bruises are tender to touch. Most often this can be treated at home. Cut - Superficial: superficial cuts (scratches) only go part of the way through the skin and rarely become infected. A scratch is an injury to the skin made by a sharp edge. For example, scratches can be caused by fingernails, a sharp nail, a piece of metal, or a branch of a tree or bush. A paper cut is a scratch from the edge of a piece of paper. This can usually be treated at home. Fracture: this is the medical term for a broken bone. It means the same thing as a break or crack in the bone. 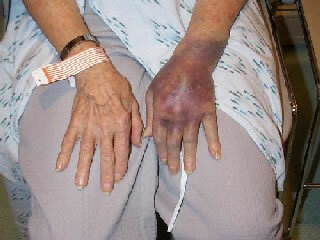 The pain is severe and there is often marked swelling. The type of treatment needed depends on the type of fracture. Sometimes a person with a fracture just needs a splint or a cast. A person with a more severe fracture may need surgery. Sprain: a sprain is the medical term used when ligaments are torn or over-stretched. Ligaments are the bands of tissue that connect bones to each other. These are common injuries from falling, heavy lifting, and sports. Pain and swelling can range from mild to severe. Minor sprains heal themselves with time and rest. 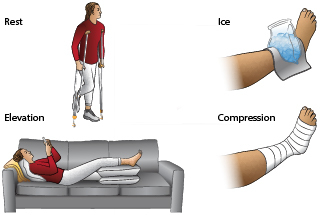 More severe sprains need a splint or a cast and take 4-6 weeks to heal. Surgery is rarely needed for a sprain. A person who hurts his or her wrist or hand and cannot hold a cup of water should see a doctor. Strain: a strain is the medical term used when muscles are torn or over-stretched. A more common term for this is a "pulled muscle." Strains may heal themselves with time and rest. Surgery is rarely needed for a muscle strain. You can treat a minor bruise, sprain, and strain at home. If the pain lasts over 2 days, apply heat to the sore area. Use a heat pack, heating pad, or warm wet washcloth. Do this for 10 minutes, then as needed. 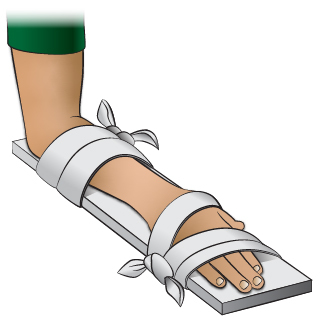 FIRST AID: Wrap with a snug elastic bandage. Put an ice pack on it to reduce bleeding, swelling and pain. Wrap the ice pack in a moist towel. REST the injured part for 24 hours. You can then return to normal activity if it is not too painful. 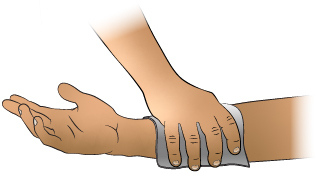 Keep injured hand or wrist ELEVATED and at rest for 24 hours. Keep your hand and wrist up on a pillow above your heart level. This 72 year old female tripped and fell injuring her left wrist. The picture shows a deformed left wrist. She went to the emergency department. Treatment included pain medications, reduction (putting the bones back into line), and casting. 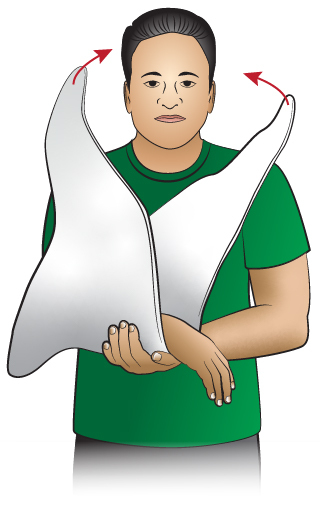 Splint: Immobilize the hand and wrist by placing them on a rigid splint (e.g., small board, magazine folded in half, folded up newspaper). Tie several cloth strips around hand/wrist to keep the splint in place. Apply a cold pack or an ice pack (wrapped in a towel) to the area.